Will 2015 be the year when digital is finally integrated into all of your marketing efforts? In the marketing puzzle, digital is a big piece to earning engagement from your target audience. The power of digital technology is the future, but your brand’s presence must also be felt across multiple marketing channels to reach your target audience. The marketing puzzle is about integrating all the necessary pieces, especially the digital one. There are many facets of digital: Search Engine Optimization (SEO), user experience, email, social, video, online learning, mobile and websites. When combined with traditional channels, digital can drive deeper brand engagement from your target audience. Digital, in its truest form, involves accessible forms of technology, such as social media and mobile devices that encourage your target audience take a step closer to your brand, no matter where they are. Digital tactics are frequently social, engaging your target audience through online experiences that they want to not only consume, but share with their friends. Whether sitting in a cafe while reading a newspaper, or in front of their television while watching a favorite show, your target audience may sometimes need a nudge to your digital presence from more traditional forms of media. In 2014, IKEA demonstrated the power of a bookbook™, an integrated marketing strategy involving a YouTube video that demonstrates the technological innovations of the company’s 2015 paper catalog. It’s seriously smart and funny because it sells the IKEA catalog as if it were an Apple iPhone 6. In a way, it also pokes fun at the fascination that so many of us have with digital platforms. At the time of writing this, IKEA’s video has over 14 million views! The truth is funny because as marketers we tend to forget that in many instances printed material can be just as effective as a mobile app, yet the hype around digital lures blinds us to all of the possible pieces of an integrated approach. IKEA doesn’t focus on digital alone. The brand experience doesn’t force people into using the catalog by denying them access to online shopping. IKEA’s catalog is integrated with a mobile app that truly fascinates and engages their audience by allowing them to see how a piece of furniture fits and looks in their home. 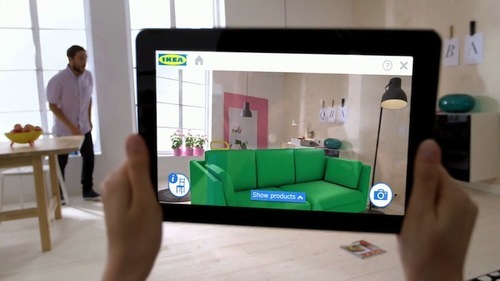 The augmented reality app allows the more tech savvy IKEA catalog readers to use their mobile devices for a fully unified experience that combines print with digital. Digital represents a gateway into the experience of brand. Integration and uniformity of the brand experience are what make it memorable. When the overall brand design shines in a consistent way across all platforms, your target audience will feel trust. If your brand has no digital presence, or your website is old and inconsistent with your print messaging, a sense of disconnect is experienced that will turn your target audience elsewhere. Digital marketing tactics must be integrated into a uniformed design strategy that bridges all media in a compelling way. If the whole puzzle isn’t seen because the pieces are misaligned, your brand will be called into question.